Dr. Guy McPherson, in this SPECIAL Carol Rosin Show, presents urgent, important, updated information with suggestions and solutions regarding facts and how each of us, including decision makers, can do to live, now, knowing we are experiencing our own human extinction, our own death and dying process. It’s about facing the facts. It is about being ultra sensitive and conscious of this reality, of who we and other animals and life forms really are, and about being honest with ourselves about the fact that we are all soon going to leave these bodies and die. It’s the best summary ever about what’s really going on. It’s about how to relate to others now. What to do! The truth! This is a deeply thoughtful, spiritual and heartfelt fact-based talk. It is based on this sad reality, that we humans and other animals will not be able to survive on this planet much longer, and how to deal with this knowing and the feelings, at all ages and in all cultures, that go with it. 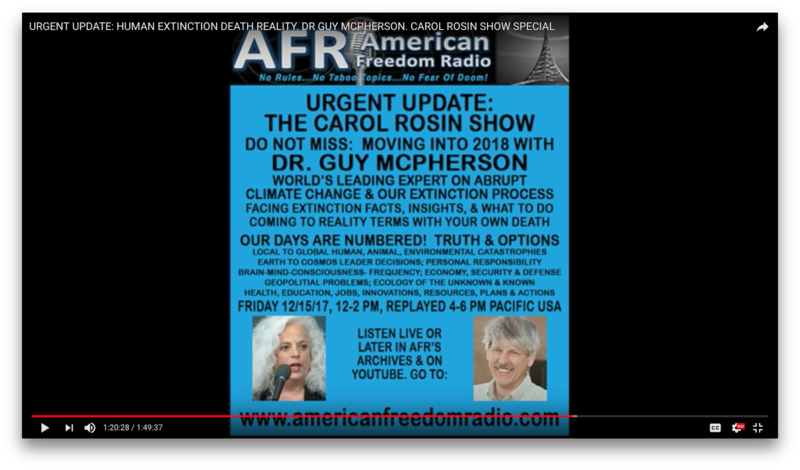 With all the suffering and destruction, the abrupt climate changes, man-made and natural disasters, catastrophic events happening and that will happen, Guy discusses how we can live, think, act, especially as we each discover we really won’t be surviving in these bodies or on this planet much longer. As we move into 2018, with each of us knowing we now have a real day by day death sentence, in his unique manner, Guy presents vitally important information couched in a perspective that is actually motivational, uplifting, energizing and inspiring…and realistic. But it’s not about having hope though because hope is not enough. It’s not about giving up, either. It is about emotional, mental and other stages each of us may experience, alone and in relationships, as we wake-up and learn about this whole reality. Guy tells us about facts we have a need to know so we can live differently, be personally responsible for the different kinds of choices and decisions we’ll make now. It is about thinking and feeling in terms of how to live when you are living with an irreversible personal and planetary death sentence, when you seriously have only a very short time to be here and now. This is about each of us “moving into 2018,” a passionate conversation that will be worth your time to hear. Dr. Guy McPherson on this particular presentation may just change your life.